In their time together as coach and captain of Melbourne Football Club, Neale Daniher and David "Neita" Neitz enjoyed one of the great partnerships in modern AFL. As teammate Russell Robertson said when Neita was being inducted into the AFL Hall of Fame: "They were our two captains in charge, steering the ship." Today, while their coaching and playing days are behind them, they're back in tandem once more. And what is it that's brought them back together? "We like beer," jokes Neale when we caught up with the pair and Neita's Brewmanity colleague Jamie Fox earlier in the week. Yet, while beer is central to their current partnership, it's very much in service of a larger goal. Since being diagnosed with motor neurone disease (MND) in 2013, Neale has gone on to found and run FightMND, a foundation that is already raising more than $10m each year towards the battle against the disease. And, since launching Brewmanity as a brewing company dedicated to raising money for good causes at around the same time, Neita has been funnelling his fundraising – more than $150,000 and counting – into FightMND. Next week sees Brewmanity kickstart its most ambitious fundraising effort to date: Beer March. It's part pub crawl, part treasure hunt, and all for a good cause. Throughout March, people are invited to register as individuals or teams of up to four via the Beer March website then set out to visit as many of the participating venues across Melbourne as they can. There are prizes along the way, including the opportunity for two groups of four to join Neita as VIP guests at The Big Freeze game at the MCG between Melbourne and Collingwood on June 11. "It has been a special relationship," says Neale. "David was there when I arrived and we were there for ten years together. David captained for how long – eight years?" "Well, seven and a half," says Neita, adding with a laugh, "until he got the sack." "There was a player revolt!" says Neale without missing a beat. Clearly, a relationship that has been maintained through regular catch ups after games, golf days, long lunches and, of course, beer remains strong. Fellow Demon Paul Hopgood is a founder of Brewmanity, while ten or more former players are involved in another FightMND fundraiser, Daniher's Drive, a car rally from Victoria into South Australia and back. 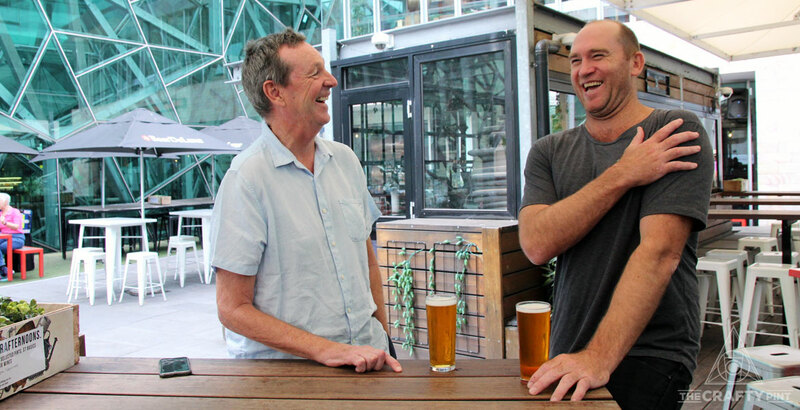 "Brewmanity has been involved [in FightMND] from the outset," says Neale, describing the brewing company's contribution to date as "outstanding". "The Brewmanity slogan is 'Beer for goodness sake'. The beer is fantastic, even for an old guy who doesn't like to change his beer tastes." Apparently, however, the coach wasn't always so enamoured with his former captain's beer. "We've slowly broken down the barriers..."
As for the Beer March, it's been pulled together in remarkably quick time, especially when you consider pubs and bars tend to be in lockdown in the lead up to and period after Christmas and New Year. It was only early December when we first sat down to discuss the concept with Neita, yet two months later 29 pubs and bars – many of them Melbourne's best craft beer venues – are on board and the Beer March is ready to roll. 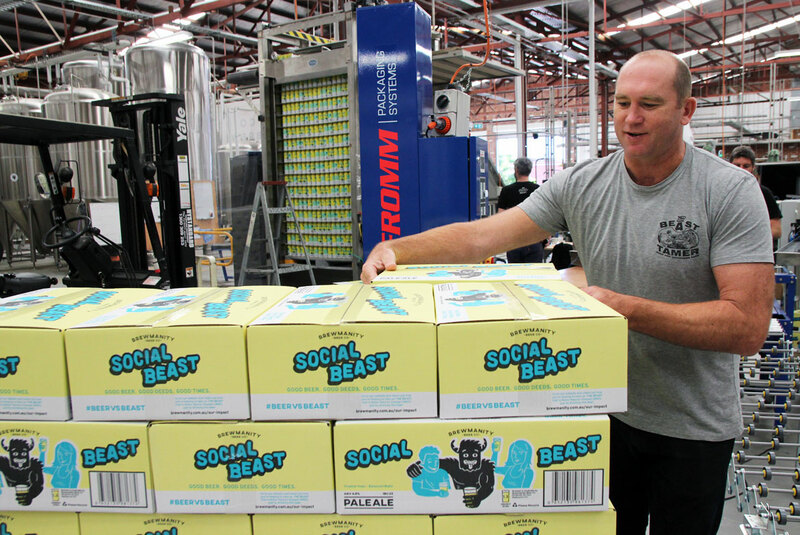 Neita on the canning line at Colonial with the Social Beast, from which he gives a percentage of all sales to FightMND. Since launching, Brewmanity has enjoyed great success with standalone events, such as Beer & Beast at Good Beer Week 2017, but he felt this put too much focus on one business rather than pushing people to the venues that make up the wider good beer community. "With all the people that go to these bars and drink in these bars, the awareness [around MND] is lifted even higher," says Neita. "[FightMND] is about putting fun into the fundraising and that's where we sit as a beer company. We can play a role in that. Our plan over the next little while is Beer March, then we're getting involved in GABS with a new beer and fundraising there as well." The hope is at least 500 people will take part in the Beer March. Already, contributions from the venues mean there's around $20,000 in the fundraising pot, with every individual and team that registers adding to that. On March 31, there will be a party at Beer DeLuxe to top things off – before the winning teams get to join Neita and Jamie for lunch and premium seats at The Big Freeze. Beyond that, the hope is for Beer March to become a national event. "We're doing the Beer March in Melbourne but our vision, if we do it well, is to expand into other states," says Neita. With that, Neale heads off to buy coffee for their follow up meeting. We continue chatting until Neita starts looking nervously over his shoulder. "We'd better go or I'll get a spray," he says. Sure enough, Neale appears on cue to fire a stern look in his direction. Ten years on, it seems the roles from their Demon days haven't been totally abandoned. You can find everything you need to know about the Beer March here, where you can also sign up to take part. Once registered, teams can head to any of the 29 participating venues across Melbourne, solve a clue, take a selfie of themselves with a glass of Brewmanity's Social Beast in front of each venue's mystery item to prove they've been then share on social media with appropriate tags. Attend five or more venues and you could win one of the VIP prizes. Make it to 15 or more throughout the month and you get a second chance to be at The Big Freeze. There will be weekly prizes for the best photos, with winners getting a case of Social Beast.